StockMaster Navigator – Mobile Warehouse Ladder. A StockMaster Naviator mobile warehouse ladder features a single control to brake and steer which keeps all four feet of the ladder firmly on the ground unless you are moving it. When you take hold of the control the ladder is raised to the mobile position for easy positive steering. Release the control and it returns automatically to the stationary mode where it is braked and completely stable. All skating and instability found with a warehouse ladder that use springs or foot pedals is eliminated and the platform remains perfectly steady. One control does it all creating a much safer product. When moving to a new location you are positioned away from the front of the ladder which allows a normal walking step and the ladder moves quickly and easily with minimal effort. Navigator will move to a new position in less than half the time of competing products. The single control also enables the platform to be used as a trolley. * The Navigator warehouse ladder is easier and faster to move around and saves time and equipment. Move up to StockMaster Navigator Pro and you are protected against accidentally stepping off the front of the platform. 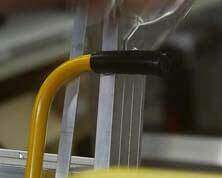 With the fully automatic StockMaster Auto-Gate your hands are free to carry an item and still maintain a safe grip as you enter or leave the work-space. And with Navigator Pro you also have StockMaster Rota-Gate which provides a gate-way at the side of the platform creating easy access for stock-picking, inspection and many other tasks. StockMaster Navigator is a modular design for easy parts replacement in the event of accidental damage. It is manufactured from high quality materials and built to last. With reasonable care a StockMaster Navigator warehouse ladder will give many years of service and cost less in the long run. *Not recommended for large sizes. StockMaster Navigator Platform Ladders are . . .
StockMaster Navigator keeps all four feet firmly on the ground unless you’re moving it. One control raises the unit to the mobile position and provides easy positive steering. 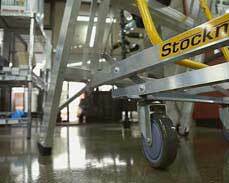 StockMaster NavigatorPRO has a Safety Rail system that can be adjusted for stock picking.